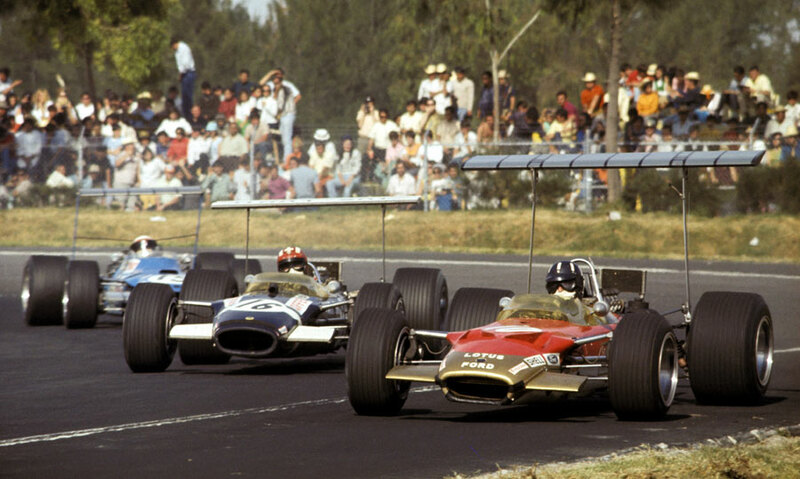 Thirty-nine year-old Graham Hill secured his second world title in empathic style with victory in the season-ending Mexican Grand Prix. Hill started the weekend leading the championship with two other drivers in close contention - however, one of them, Denny Hulme, crashed for the second race in succession while the other, Jackie Stewart, endured a series of mechanical setbacks and finished well down the field. While the trio were the centre of attention, Jo Siffert in a Rob Walker Lotus took pole ahead of Chris Amon, Hill and Hulme. Stewart's hopes were dealt a major blow when he was forced to start from the back of the grid after a four-car pile-up during qualifying. But Stewart had a brilliant start, and by the fifth lap he had taken the lead with Hill and Hulme right behind him - the three contenders going head-to-head to the delight of the crowd. On the tenth lap Hulme's hopes ended when a shock absorber broke as he passed the pits, causing his McLaren to spear into the barriers and catch fire. "I don't know what happened," he shrugged to reporters. "Something in the suspension broke. I hit the wall." Hill took the lead from Stewart and Siffert, but while he was able to last the 65 laps without any pit stops, the other two hit problems. Siffert had to stop to have attention to his throttle cable and Stewart was battling with a fuel-pump problem which meant his engine cut out on every right-hand corner. As the end approached Hill knew the title was his, and he even had the time to use his car to help team-mate Jackie Oliver, blocking Pedro Rodriguez whenever he tried to pass the second McLaren and helping Oliver to third place behind Bruce McLaren. On the podium a sombrero was placed on his head and he took it off and poured champagne into it. "I had a lovely time," he said. "The car went beautifully. I am very pleased to have won." It was a bitter-sweet day for Lotus and Colin Chapman. The joy of victory was tempered with the knowledge it had come at a huge cost with the deaths of Jim Clark and Mike Spence. Back in London, Hill's wife Bette was asked by reporters if her husband would now retire. "He will definitely not," she replied. "He enjoys racing and makes a good living out of it."